Learning to sew is easier than you think. 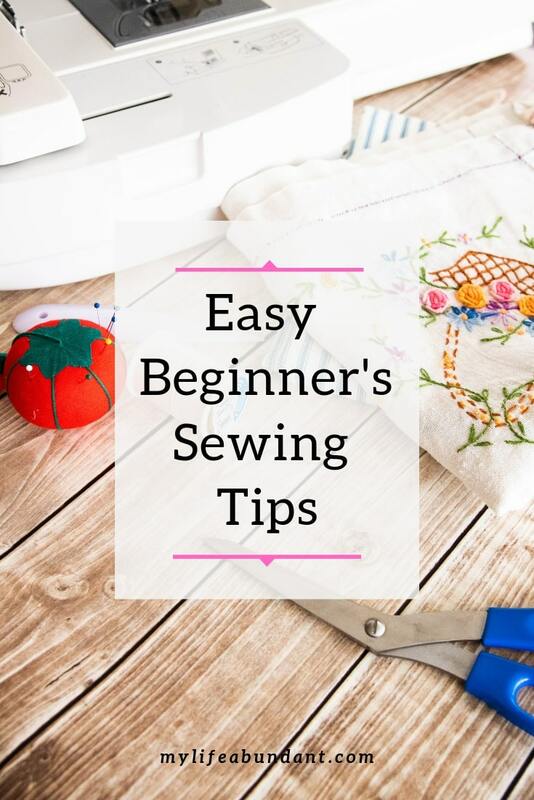 Here are a few of my beginner’s sewing tips to help anyone get started sewing. I love to sew. I learned a little from my mom and then learned more in Junior and Senior High School in Home Economics class. Do schools even have Home Ec anymore? I have to admit. I loved those classes. I think I also might have been inspired by my dad who did a lot of upholstering while he was in the Navy and after he retired. He taught me simple ways to reupholster chairs. So, a sewing machine pretty much has been around all my life. After I married, I made so many clothes for myself, gifts for family and other items for the home. I could make a whole outfit for just a few dollars and use the same pattern over several times. I loved making simple little sundresses for summertime. And when my son was born, I made his little rompers while he was small and a few costumes for Halloween and other activities. But as time passed, my sewing machine sat idle in the closet for several years mainly because life got in the way, the cost of sewing started to rise and it was just easier for me to purchase clothes at a store. I would occasionally drag it out to make something quick. But for the most part, I lost interest. Now that I have more time on my hands, I have brought out my sewing machine again to make a few things for our home and make repairs on clothes. 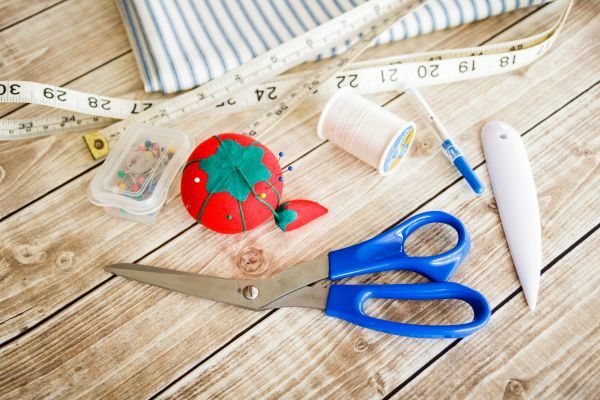 In this post, I am sharing my best sewing tips and tricks from years spent sitting at a sewing machine. Depending on what kind of sewing you will be doing, choose the machine for your needs. I’ve owned 2 sewing machines in my lifetime. The first was a hand me down that basically did your basic stitches and was perfect for what I needed when it came to making clothes. I then went to an Embroidery Machine when I had my Monogram Store for a few years. That machine not only embroidery’s, but it also does all the basic stitching too. A sewing machine is an investment that you want to last for years. Even though the sewing machine is the backbone of sewing, having good accessories will just make the job easier in the long run. Here are a few of my “must have” sewing accessories. Scissors – Having a pair of good scissors just for sewing is a must. I use my 8″ scissors to cut material and use the 5″ scissors to cut small areas and thread while I sew. NEVER cut paper with your sewing scissors. There is no quicker way to dull your scissors than to cut paper with them. Ball Head Pins – Using pins while sewing is the best way to hold the material together while you sew and will give your project a more professional look. Using pins with ball heads makes it easy on your fingers and easy to see while sewing. My favorite pins are 2 inches long and will go through thick material easily. I also use a Dritz tomato pin cushion to keep my pins close by while sewing. It will also keep your pins clean and sharp. I have such wonderful memories of my mom using this same tomato pin cushion while she sewed. Thread – I’ve been using Coats & Clark all purpose thread as long as I can remember. It’s available just about anywhere and there are so many colors to choose from to match any sewing project. There are also thicker or metallic threads to choose from depending on your project. I do use a thicker thread for jean repairs. Sewing Machine Needles – Sewing needles need to be changed often when they get dull. Dull needles will break or pull at the material and only cause headaches. I use Schmitz needles which come in different sizes depending on the material. EX: When repairing jeans, you want a very heavy/thick needle so it won’t break going through thick material. Seam Ripper – My seam ripper is probably used more than my scissors. I use it for so many things. Taking a pillow apart, taking up or letting out clothes, etc. It’s the best way to tear thread and not damage the item. I always have a couple of these in my sewing box. 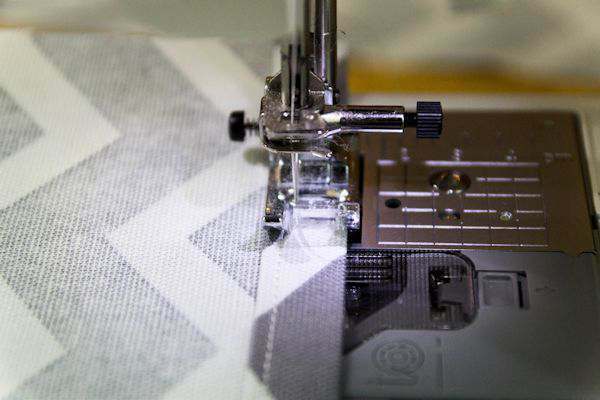 Point Turner – I’m sure many of you haven’t heard of a point turner, but when it comes to making sharp, crisp, perfect pointed corners in pillows and clothing, it is a must. It’s easy to use and trust me when I say, don’t use scissors to push out points in projects. Tape Measure – I love my tape measure. I’ve had it since high school sewing class and I actually hang it on my office door for easy access when I need it. I use that tape measure for so many things throughout the house. It has yellowed over time but since its made of vinyl, it will be with me for a long time. I have a newer extra one in my sewing box just in case. Steam Iron – After years of sewing, this may be the most important thing to have available while sewing. Press your seams open as you go for a more professional look and you will be so much happier with the finished product. I often will press the material before I make the first stitch, especially if its cotton or linen. It really will help you save time as you go. I really don’t have a Sewing Box per se, but I use a plastic bin with several smaller plastic bins to hold all my items. 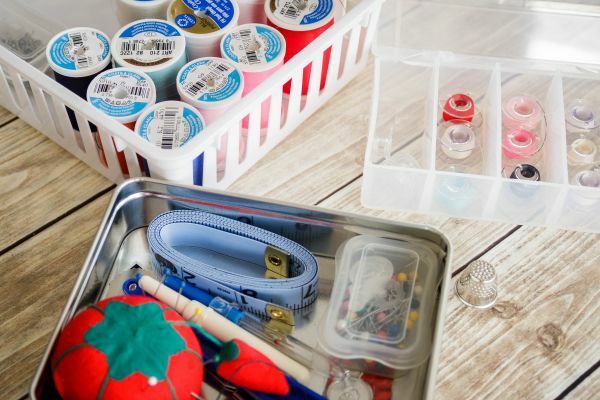 I use a large Y-Weave plastic basket with a cute antique label holder on it to hold all my sewing items, sewing machine items, and accessories in my office closet. I use a smaller plastic Dollar Store bin for my thread, bobbin thread box for all my bobbins and an old metal bin for items I use all the time if I need to do a quick mend. As you can see, you don’t need anything fancy to hold all your sewing items. 1. Before you start any project, its a good idea to wash and dry your material. When buying material, there is a stiffness to it that isn’t easy to sew with or to iron out. This is especially true if you are making clothing. It will break your heart when you work hours on a beautiful dress and then launder it to only find out the material shrunk and you can’t wear your masterpiece anymore. 2. Use pinking shears or sew a zig-zag edge on your material. This will keep your material from having long strings hanging from the materials edge and keep it cleaner and more professional looking. 3. When learning to sew, start off with something easy. A simple envelop pillow is a perfect example and you won’t have to worry about putting in a zipper, buttons or hand sewing the pillow shut. Just sewing simple straight lines. Choose a material that doesn’t have stripes because trying to match the stripes is a little harder to do when learning how. What I love the most about sewing is every time I bring my sewing machine out of the closet, it brings back memories of my grandmother making dresses for me and my Barbi. She would mail our clothes to us after she made them and didn’t even have us there for measurements! She did such a wonderful job and we always looked so cute in them. And all the memories of my mother sewing clothes for us and dad doing upholstery work. I especially love that amazing feeling of accomplishment I get when I’ve finished a project. That feeling will ALWAYS put a smile on your face. Sewing is something all girls should at least try to see if they enjoy sewing. I remember some of my first sewing projects. I made some really cute pillows. I will have to try out your tips. I am a pretty terrible sewer. I did it in home ec and didn’t do the greatest. My Mom can sew pretty well so if I need something done, she’ll do it. I wish more boys would try sewing! Thank you so much for the tips. I bought a sewing machine and just keep looking at it, feeling intimidated, lol. I’ve never even thought about sewing a zig-zag edge before so I’m learning a lot so when I get started, I can create something that won’t fall apart. 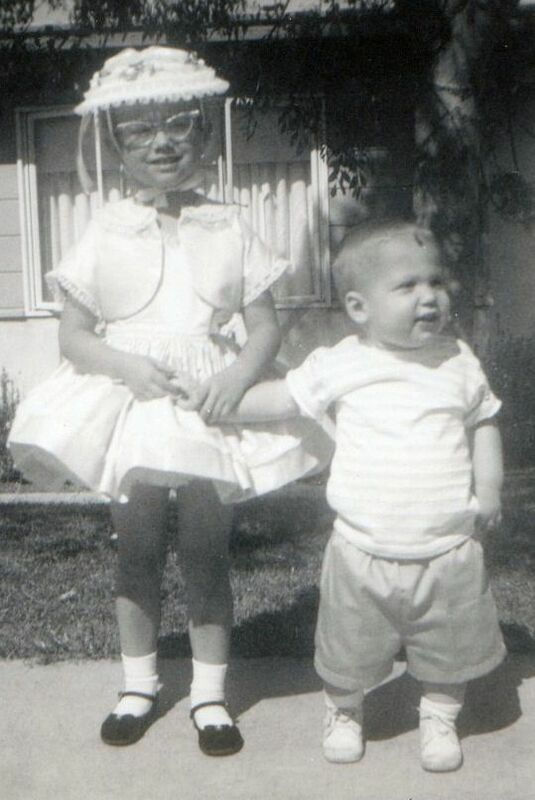 My mom was an expert seamstress. She made so many of my clothes when I was little. She also made Barbie clothes for all my dolls. Later, she made Cabbage Patch Kids clothing when my girls were little. My mom and I had the same Home Ec. teacher and I remember her telling me if I paid attention I could be a good seamstress like my mom. I didn’t and boy, I wish I would have. These are such great tips! These are really helpful sewing tips. I can’t wait to get back into sewing. I used to sew a lot when I first purchased my machine. I feel like such a sllacker because I don’t have a sewing machine. I do some necessary darning here and there but nothing like you have shown. I used to sew wi my mom but I haven sewn in forever. I need to get back into it, because I do miss it. 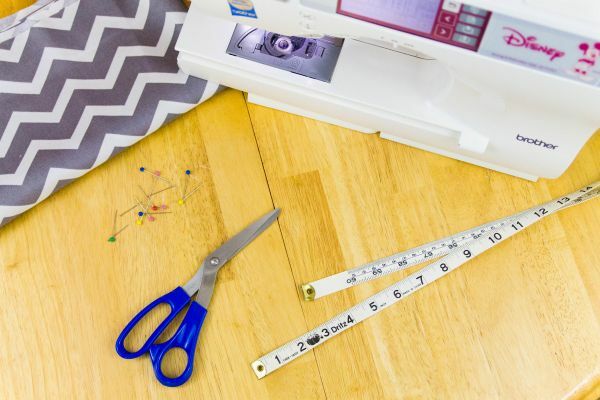 Great tips./ I am not an expert by any stretch but I have made several outfits over the years and I am comfortable saying my oldest girl knows her way around the sewing machine too. My Mom gave us her machine a few years ago and it is decent. I am always amazed at how few people can do even a simple task like seeming something anymore. These are life skills that save money here. I made all of the curtains in my old house. One set was a complicated roman blind with material – my MIL helped me with that. I will always remember her helping me with those actually. You are making me want to get that machine out again. These are some great tips. I used to actually enjoy sewing, the idea of being able to bring something to life which is useable always interested me. I’ve always wanted to learn to sew. Years ago, I bought myself a machine with every intention of learning. And it sat in my closet until my then 10 year old took it out and taught herself to sew. I still haven’t learned. One of my birthday gifts one year was a sewing box. It was really nice, a place to hold patterns and all the necessities. Thanks for bringing up such great memories. I am glad that I am able to read this article. I am not good in terms of sewing but these tips will definitely help me to improve in sewing my kids clothes. My mother loves sewing! I would like to learn one day! I didn’t know that cutting paper with sewing scissors can dull it. Thanks a lot for the tips. I’ve always wanted to try sewing, so these tips are wonderful for me. 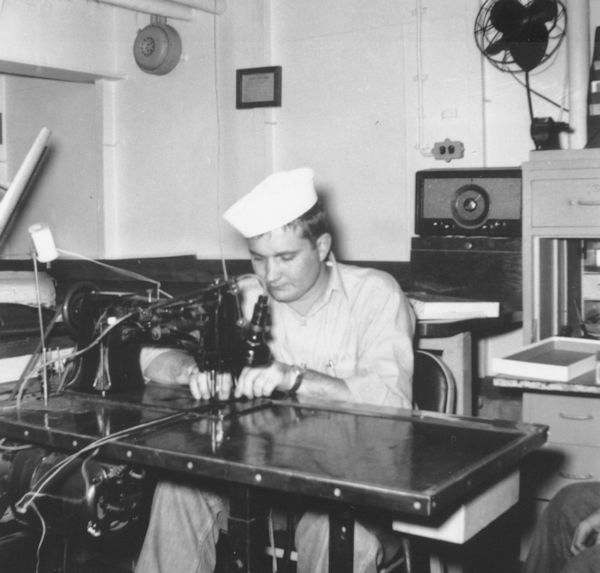 My husband also learned to sew in the navy, and does most of our alterations or repairs, but I would love to learn myself and begin some projects while my kids are still young! I never liked sewing before because I didn’t really try t. Nobody taught me, ha! I am ready to try it now, thank you for the tips! My mother loves sewing and she is very good at it. I remember that i had to help her and use the sewing machine, pretty fun! I haven’t sewed anything in years but I want to get back into it. I have so many projects sitting on my “to-do” shelf!! And around here I haven’t found a good enough hiding spot for my scissors. LOL Kids love to do crafts and are forever finding my scissors! Great starter tips. Found you on Wonderful Wednesday Blog Hop.